As a homeschooling family we are always on the look out for great new apps and so we were delighted to find the new KidQ App From Scholastic Parent and Child. We all know that sometimes it can be frustrating when your child spends too much time on their phone or electronic device. It can be difficult to get their attention sometimes. 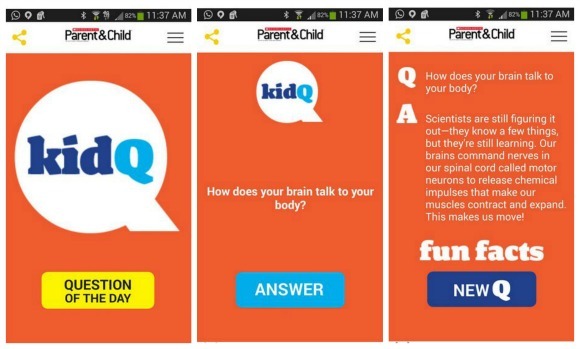 But the new KidQ App From Scholastic Parent and Child actually encourages conversation and discussion between you and your children. This free app asks questions that will inspire conversation. It asks questions like “Why is the sky blue?” “Why do we say “ears” of corn?” All great starters for some lively conversation and an official answer is given for each question. You can even set a time each day when you would like a new question sent to you. It is great to download this fun app and take it in the car so that you always have a new topic to talk about. We travel a lot so I plan on using this app to make the long journeys just that bit easier. It can also encourage some great conversations during dinner! This post is sponsored by Scholastic Parent & Child and I have received compensation from them. As always my opinions are very much my own. Join MomShare, Share your Opinion and get a coupon good for 25% off any Step2 or Infantino Product!